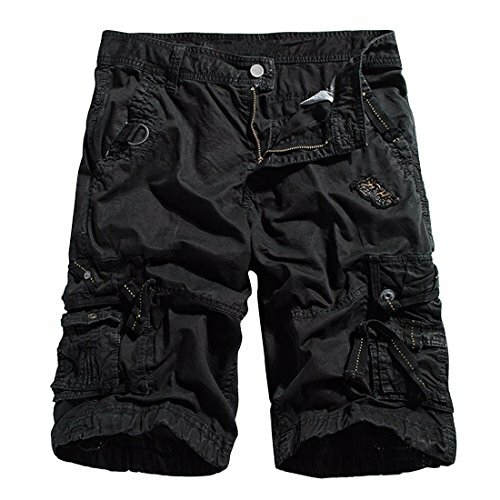 Twill Cargo Shorts FEATURES: PREMIUM SUPER HIGH QUALITY ~!!! 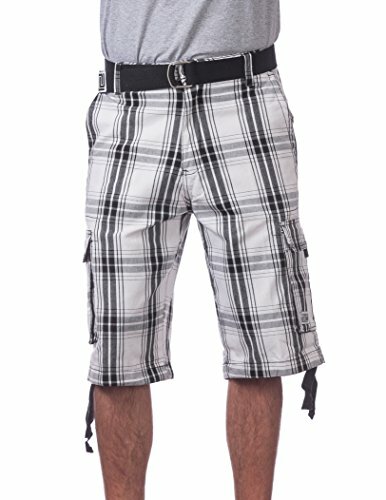 Casual Heavy Weight Size: Waist: 30" Inseam: 13" Total Length: 25" Waist: 32" Inseam: 13" Total Length: 25" Waist: 34" Inseam: 13.5" Total Length: 25.5" Waist: 36" Inseam: 13.5" Total Length: 25.5" Waist: 38" Inseam: 13.5" Total Length: 26.5" Waist: 40" Inseam: 13.5" Total Length: 26.5" Waist: 42" Inseam: 14" Total Length: 27" Waist: 44" Inseam: 14" Total Length: 27" Waist: 46" Inseam: 14" Total Length: 27" Waist: 48" Inseam: 14.5" Total Length: 28"
Pro Club Men's Cotton Twill Cargo Shorts are the ultimate combination of style, utility, and comfort. 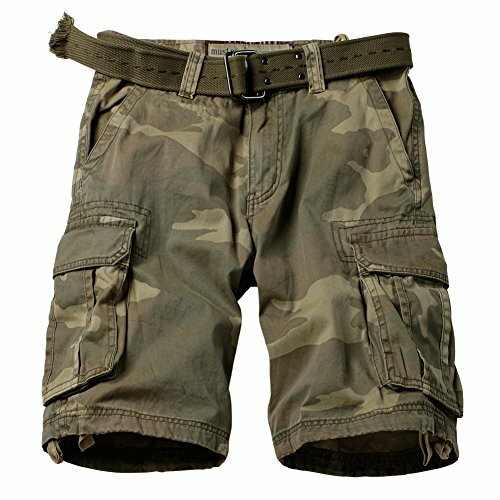 Crafted from 100% cotton woven twill with a classic loose fit, these shorts are breathable and comfortable, yet still durable and rugged.With a longer length, these shorts are designed to fall below or at the knees depending on height. 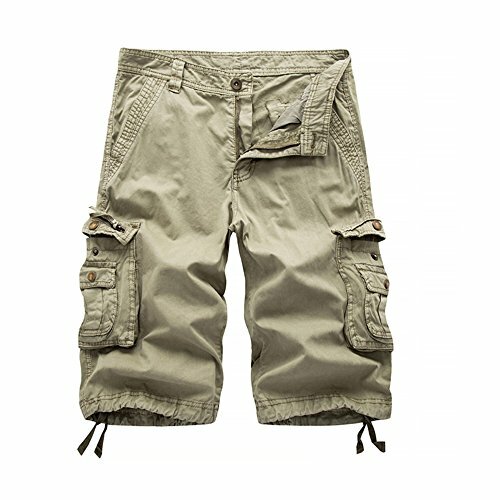 Includes a total of six functional pockets: two side pockets, two rear pockets with velcro-closure flaps, and two side cargo pockets with velcro-closure flaps; these shorts are can hold all of your gear and then some!Pro Club is renown for over 30 years of quality product. 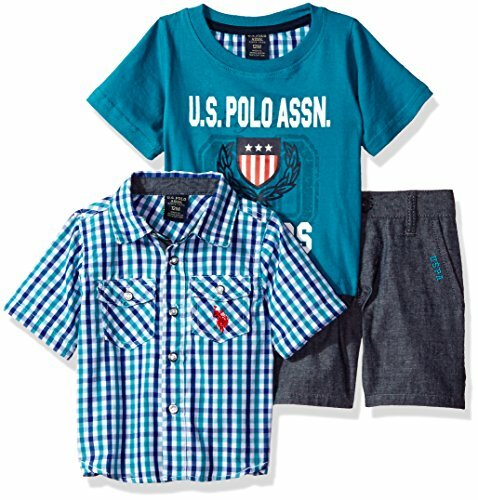 Your mission for style and comfort ends here.Machine wash cold / tumble dry low. 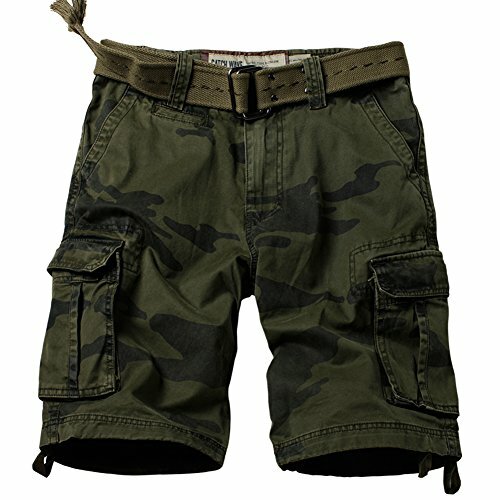 MADHERO Mens Cotton Twill Solid Color Flat-Fronted Elastic Cargo Shorts PLEASE CHECK THE SIZES BELOW CAREFULLY BEFORE PLACING AN ORDER Sizes Chart:(Unit:INCH) Positions:Waist- Length - hip size S : 33" - 14.875"- 42.5" size M : 35" - 16.25" - 44.5" size L : 37" - 17.375"- 46.5" size XL: 39" - 18.55" - 48.5" size 2XL: 41" - 19.875"- 50.5" 1.Fabric: 97% cotton , 3% spandex , 240 grams . 2.Colors: Lake Green , Navy , Red , Beige , Charcoal Grey totally 5 colors for choosing . 3.Its fabric make it more elastic while wearing that could make you move flexible when doing some sports . 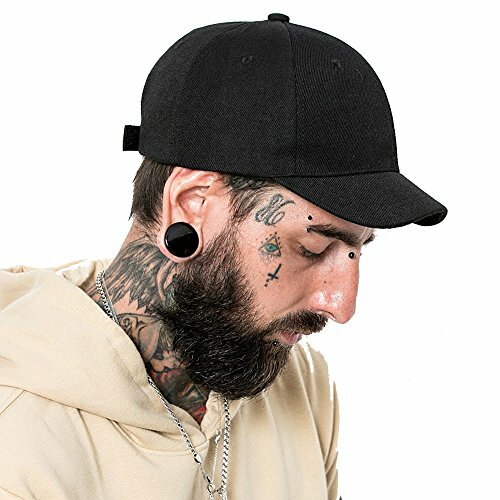 4.Garment Dyed wash for soft and more comfortable fitting feels like your favourite once . 5.Machine wash available,but wash separately . 6.Normally it takes 2-7 DAYS for having it on hand . 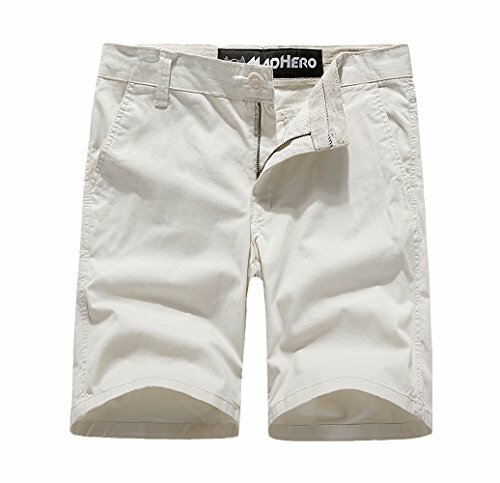 1.ITEM SPECIFICS Occasion:Outdoor Fit Type: Slim fit Season: Summer Closure Type: Zipper Fly 2608#Size chart: Size 29: Waistline 30.5"/77.5CM; Hipline 40.2"/102CM; Length 21.1"/53.5CM Size 30: Waistline 31.7"/80.5CM; Hipline 41.3"/105CM; Length 21.7"/55C Size 31: Waistline 32.9"/83.5CM; Hipline 42.5"/108CM; Length 22.2"/56.5CM Size 32: Waistline 34.1"/86.5CM; Hipline 43.7"/111CM; Length 22.8"/58CM Size 33: Waistline 34.8"/88.5CM; Hipline 44.9"/114CM; Length 23.4"/59.5CM Size 34: Waistline 36.4"/92.5CM; Hipline 46.5"/118CM; Length 24.0"/61CM Size 36: Waistline 38.0"/96.5CM; Hipline 48.0"/122CM; Length 24.6"/62.5CM Size 38: Waistline 39.6"/100.5CM; Hipline 49.6"/126CM; Length 25.2"/64CM Size 40: Waistline41.1"/104.5CM; Hipline 51.2"/130CM; Length 25.8"/65.5CM Size 42: Waistline42.7"/108.5CM; Hipline 52.8"/134CM; Length 26.4"/67CM Deviation range:0.5-1"
1.ITEM SPECIFICSFit Type: Loose fit Season: Summer Closure Type: Zipper Fly #8062Size chart:Size 29: Waistline 30.5"/77.5CM; Hipline 40.2"/102CM; Length 21.1"/53.5CMSize 30: Waistline 31.7"/80.5CM; Hipline 41.3"/105CM; Length 21.7"/55CSize 31: Waistline 32.9"/83.5CM; Hipline 42.5"/108CM; Length 22.2"/56.5CMSize 32: Waistline 34.1"/86.5CM; Hipline 43.7"/111CM; Length 22.8"/58CMSize 33: Waistline 34.8"/88.5CM; Hipline 44.9"/114CM; Length 23.4"/59.5CMSize 34: Waistline 36.4"/92.5CM; Hipline 46.5"/118CM; Length 24.0"/61CMSize 36: Waistline 38.0"/96.5CM; Hipline 48.0"/122CM;Size 38: Waistline 39.6"/100.5CM; Hipline 49.6"/126CM; Length 25.2"/64CMSize 40: Waistline41.1"/104.5CM; Hipline 51.2"/130CM; Length 25.2"/64CMDeviation range:0.5-1"